WP10 won't boot. What does this screen mean? Anyone know what the picture below means? I registered with Insider and installed W10 as soon as it was available on a 635 (one of several backup WPs I have). I planned to use it but since MS forgot to include the option to turn on voice text reading and responding in that release, it was completely impractical. Fast forward to today. A relative wants to borrow the 635 so I find it and plan to use Software Recovery program to restore 8.1. 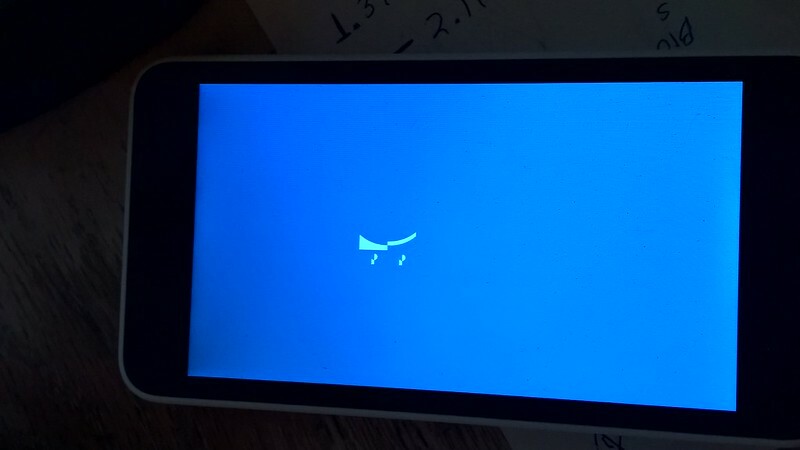 But when I plug it into the PC, it fires up and starts alternating between a black screen that just says Nokia in white letters and the image below with a delay of about a minute (just guessing) between. Its been doing this for well over an hour now and on two different chargers. It's possible the phone battery had been run down. The phone had been powered off but I don't know how long it sat in that state. But its had time to recharge enough to boot by now. Soft reset via buttons and removing reinstalling the battery has no affect. I couldn't find the button sequence for hard reset with a 635 but doubt it would help. You can soft reset the phone using hardware buttons (just search how to do it using hardware buttons). If it doesn't work, do a hard reset using hardware buttons. Last edited by tushardhingra; 04-05-2015 at 02:54 PM. Charge it to full and try the Lumia Software Recovery Tool. As I said in the initial post, a soft reset had no effect. I looked it up but couldn't really do a hard reset via buttons because the instructions call for the phone to be charged but off and to plug in the charger after pressing some buttons. But the phone wouldn't turn off. Its only state was alternating between the Nokia screen and the one nobody knows what it is unless possibly a malformed frownie. Anyway, I went ahead and used the recovery tool as suggested and it restored and all is well. I'm thinking that there might be something about the WP10 beta that leaves things messed up if the battery goes dead. Of course that presupposes the battery did go completely dead. How to get rid of calendar appointments on lock screen? Grab this sleek Lumia 1020 skin case today for just $4.95!